This grain-free granola is crunchy, sweet, and the perfect make-ahead breakfast. 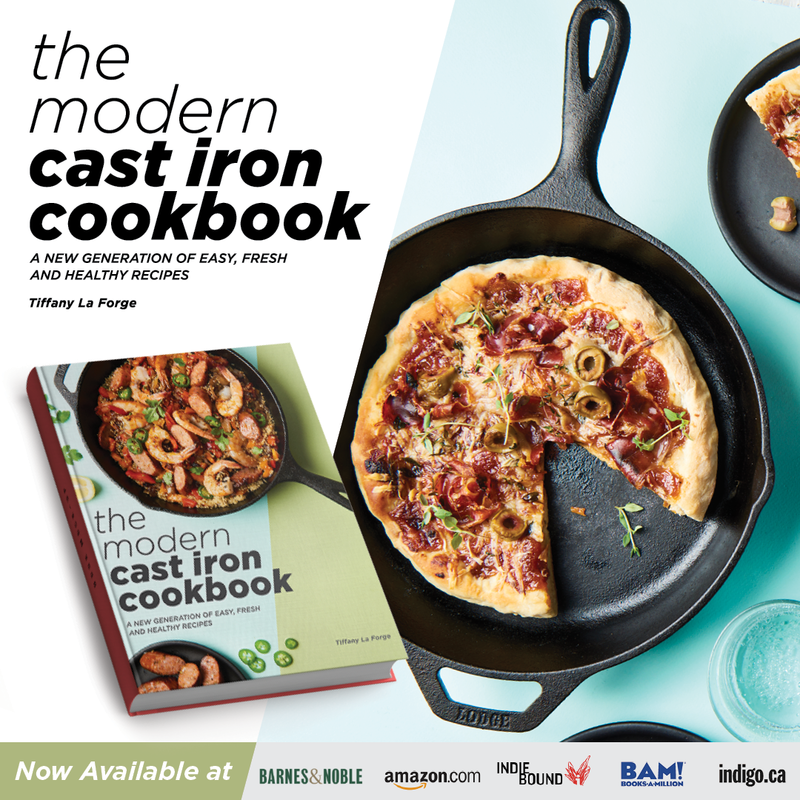 It’s also packed with superfoods, including coconut oil, ginger, chia seeds, flax, blueberries, and more! This post was sponsored by Crisco® Coconut Oil as part of an Influencer Activation for Influence Central and all opinions expressed in my post are my own. I’m going to tell you guys a secret. I hate making breakfast for myself. Okay, so probably not the juiciest secret ever, but it’s true. I love making breakfast on the weekends or for other people, but on weekdays I refuse to turn on a stove in the morning. I’m not a morning person. At all. Once I’ve had at least two cups of coffee, I decide I should probably eat something. It’s almost always one of three things: avocado toast, a fruit-and-nut bar of some kind, or granola with almond milk. Easy peasy, done and done. I never really paid attention to what was in my store-bought granola, because granola is always healthy, right? (Wrong.) I thought if I was buying a high-quality, organic brand that it was fine. Taking a closer look at some of my favorite granolas showed that wasn’t always the case. Evaporated cane juice is almost always the first or second ingredient, and some even had corn syrup. (I like this NPR article on “evaporated cane juice” and this one from Processed Free America.) And while I don’t eat a strict gluten-free diet, I have changed to eating mostly gluten-free foods, including bread, pasta, and granola/cereals. 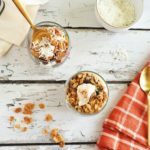 All of which has inspired me to make my own granola: this superfood-packed and naturally sweetened Grain-Free Granola! This fruity, crunchy grain-free granola is packed to the brim with superfoods of all kinds. There’s nuts, flax, pepitas, coconut, chia seeds, raw honey, cinnamon, ginger, and wild blueberries. Each of these nutritious additions add a ton of health benefits. Let’s explore. I know there’s a lot of controversy against coconut oil at the moment, but I am a firm supporter still. Organic, unrefined coconut oil is healthy in moderation. Unrefined coconut oil has antioxidant, antimicrobial and anti-cancer properties. Coconut oil can improve energy and endurance and boost the immune system. 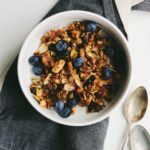 I love to use coconut oil in this grain-free granola, as it helps it get nice and brown and crunchy. Here I used the new Crisco® Unrefined Organic Coconut Oil. This organic coconut oil is a great choice to replace butter or other oils in just about any of your recipes, including baking. 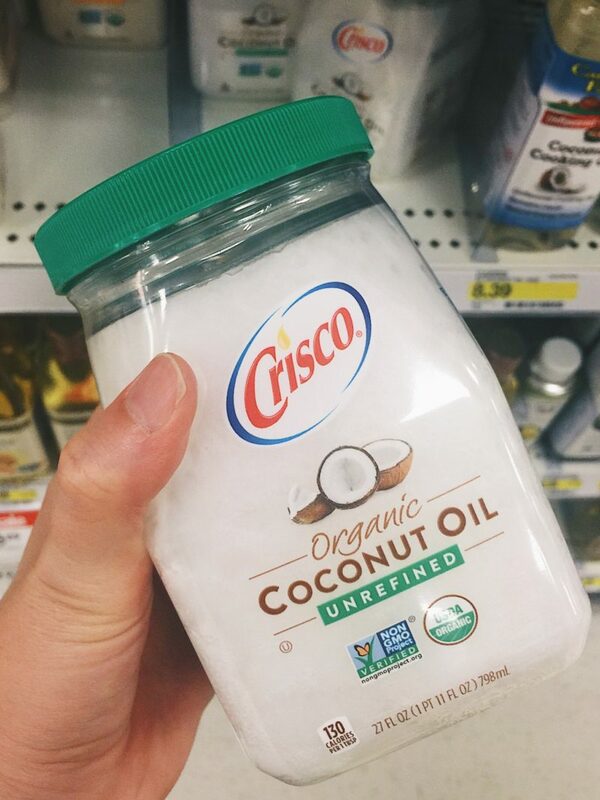 The unrefined version imparts a lovely, distinct coconut flavor, but you could use the Crisco Refined Organic Coconut Oil if you are looking for a neutral coconut oil that has no flavor or aroma. I picked mine up at Target (happiest place on Earth), which is also offering a 25% off coupon through Cartwheel until October 7th. Almonds are high in both protein and fiber, keeping you fuller for longer. They are the most nutritionally-dense nut, lowering “bad” LDL cholesterol and aiding in heart health. Almonds are also high in potassium, vitamin E, iron, calcium, and magnesium. These tasty nuts are also loaded with antioxidants, and studies have proven that they can reduce oxidative stress. Another heart-healthy superstar, walnuts are an excellent source of omega-3 fatty acid, phytosterol, and antioxidants, which makes them great cancer fighters. Their benefits don’t stop there. Since walnuts are high in biotin, they’re excellent for the hair, skin, and nails. These nuts also protect the brain and can help prevent Alzheimer‘s disease. Buttery, delicious cashews are one of my favorite nuts. Although they don’t have the same fiber content as walnuts or almonds, they’re still great for you in other ways. Like walnuts and almonds, heart-healthy cashews lower your risk for cardiovascular disease. The high copper and iron content in cashews also aid in keeping our blood vessels and immune system healthy. They are also high in vitamin K, magnesium, zinc, and protein. Pumpkin seeds aren’t just an afterthought to Halloween pumpkin carving. I eat these guys year-round for their incredible health benefits. They’re loaded with heart-healthy magnesium, zinc, and omega-3 fatty acids. They also possess anti-inflammatory properties and can boost serotonin levels due to their high tryptophan-to-protein ratio. Serotonin can lead to better mood, sleep, appetite, and overall function. The world’s tiniest superfood! Chia seeds are one of the best sources of plant-based protein, fiber, and omega-3’s. The benefits of these tiny seeds are vast, from aiding in blood sugar regulation to reducing inflammation to improving brain function. There’s 10 grams of fiber per ounce of chia, which equals 30 percent of your total daily recommended value. Chia seeds are also high in calcium, containing five times more calcium than milk per ounce. I love adding flax in wherever I can because of its excellent fiber content. Flaxseeds are loaded with nutrients, fiber, protein, healthy fats, B vitamins, and cancer-fighting lignans. Flaxseeds contain up to 800 times more lignans than other plant foods, and have been shown to prevent breast cancer and prostate cancer. Raw, wild honey is delicious and my go-to natural sweetener. Raw honey is pure, unpasteurized, and unprocessed. It’s a natural energy source and chock-full of disease-fighting antioxidants. The anti-inflammatory properties of honey can also aid in allergy relief and boost the immune system. Raw honey is anti-allergic, anti-bacterial, and anti-inflammatory, and has been proven to neutralize toxins, relieve pain, and treat coughs (better than drugs). 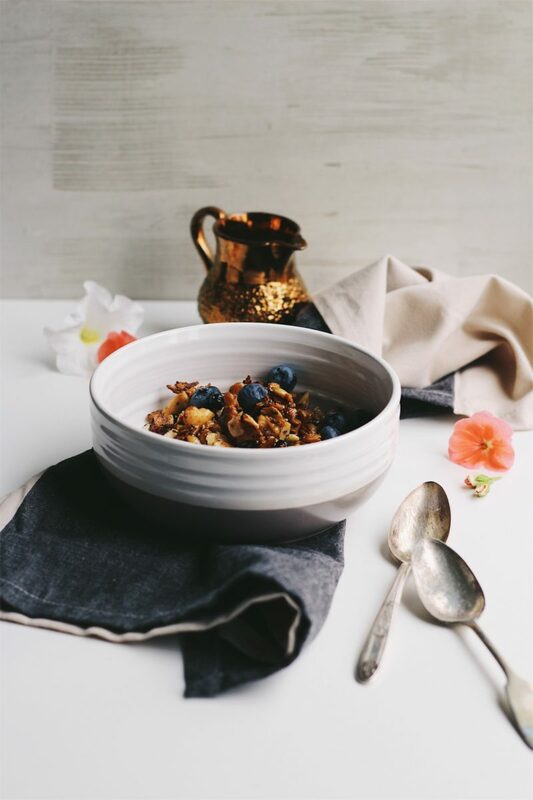 Our grain-free granola gets a fruity punch of flavor from dried, unsweetened wild blueberries, which are high in antioxidants, fiber, vitamin C, and nutrients, but low in calories and sugar content compared to most fruit. Blueberries boost brain health, regulate blood sugar, and support digestion. Cinnamon has been well-known for its medicinal properties for ages. I always use Ceylon cinnamon, also known as the “true” cinnamon. Cinnamon is a superfood, full of antioxidants and cancer-fighting compounds. The antimicrobial effects of cinnamon are linked to preventing tooth decay and inhibiting harmful bacteria growth. Like cinnamon, ginger contains powerful medicinal properties. Ginger is most commonly known as preventing and treating nausea, but its health benefits go far beyond that. Anti-inflammatory ginger can reduce muscle pain, ease osteoarthritis discomfort, and reduce menstrual pain as effectively as drugs. Ginger is also a great source of natural energy and aids in digestion. Per serving, this grain-free granola has 201 calories, 4 grams of fiber, and 6 grams of protein. 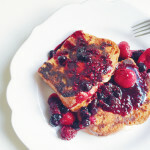 It is delicious served with almond milk and fresh blueberries, over Greek yogurt (for even more protein! ), or by itself for a crunchy, filling snack. 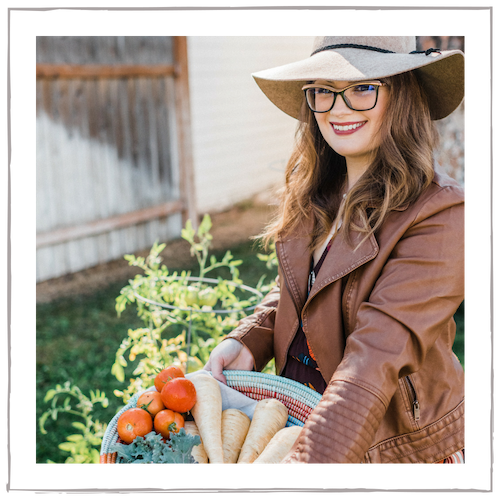 This post contains affiliate links, and are always products I love & highly recommend. This grain-free granola is crunchy, sweet, and the perfect make-ahead breakfast. 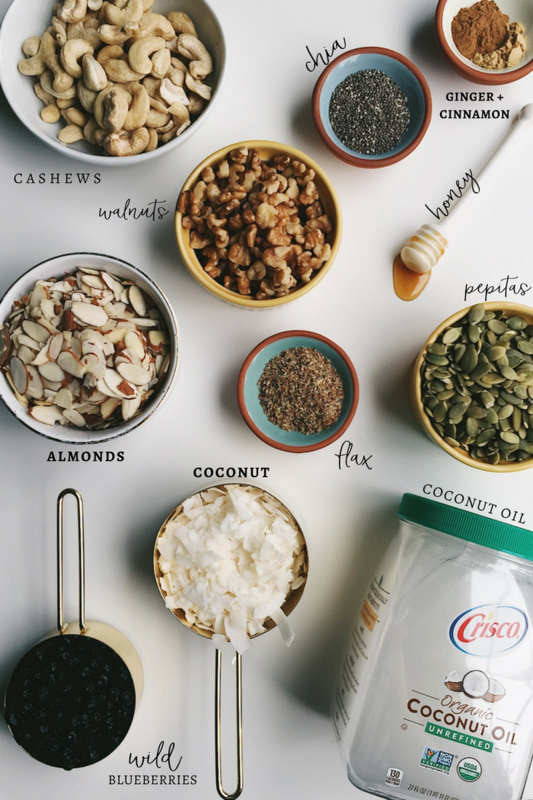 It’s also packed with superfoods, including coconut oil, ginger, chia seeds, flax, blueberries, and more! Preheat the oven to 300°F and line a full baking sheet (or two half sheets) with parchment paper. 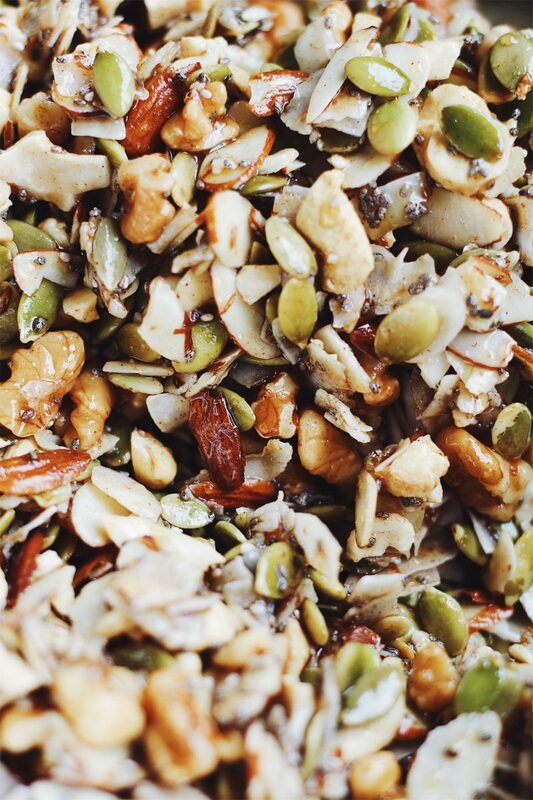 In a large bowl, mix together the nuts, pepitas, chia seeds, flax, flaked coconut, cinnamon, ginger, and sea salt. In a small pan, heat the coconut oil and honey until warm and melted, but not boiling. Remove from heat and stir in the vanilla. 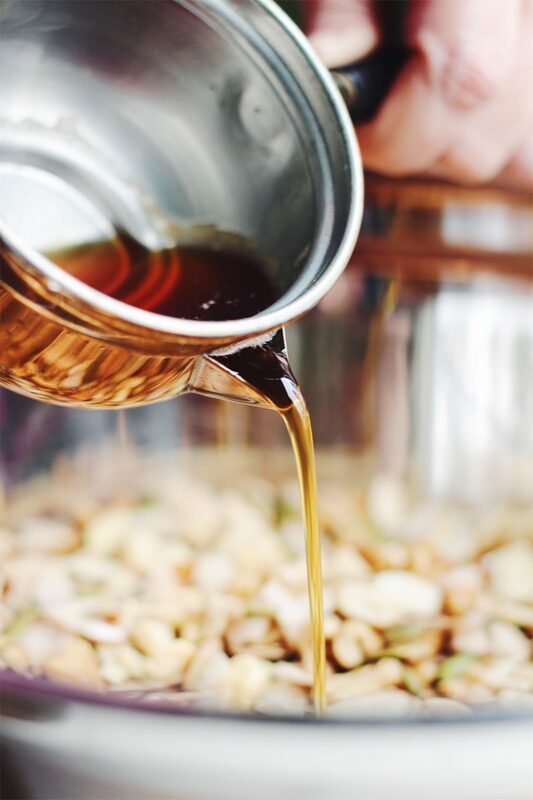 Pour the honey mixture over the nut mixture and stir very well to combine. Pour the granola mixture on the baking pan (or divide evenly among two) and press down with an offset spatula. 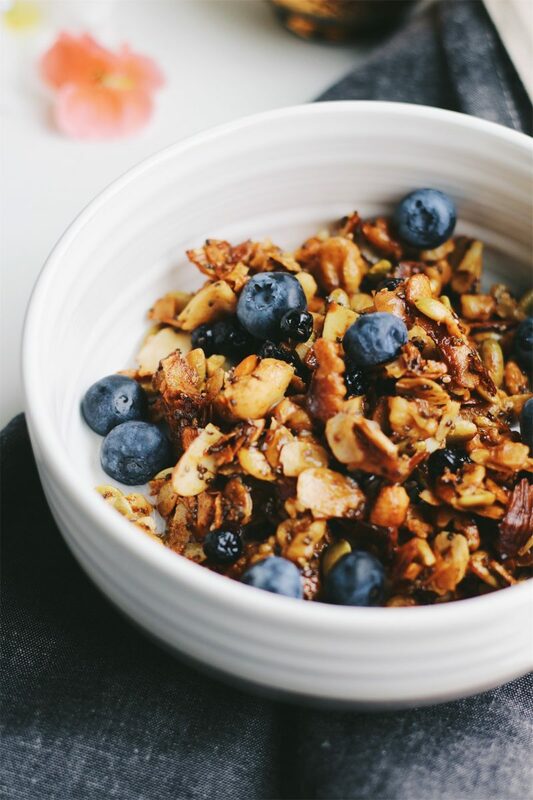 Bake the granola until golden brown and crisp, about 22-25 minutes. 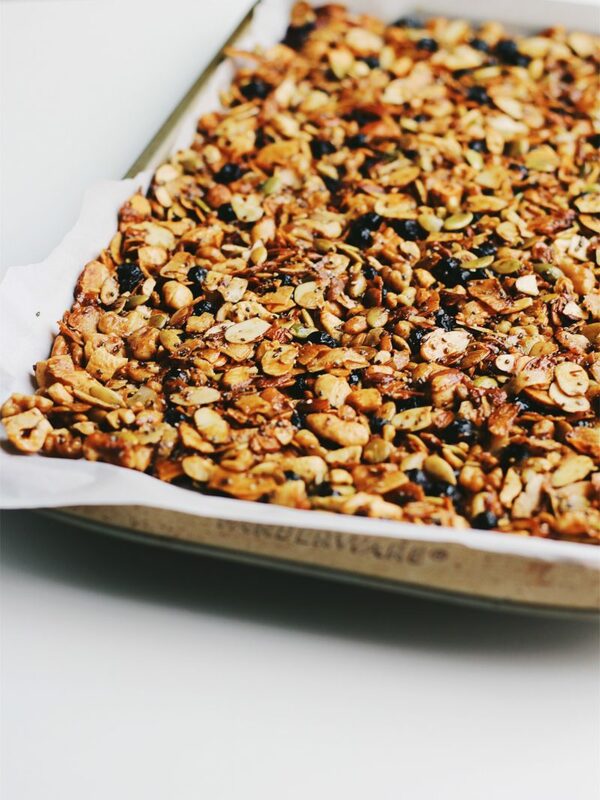 Stir the granola once or twice while baking to ensure even browning. 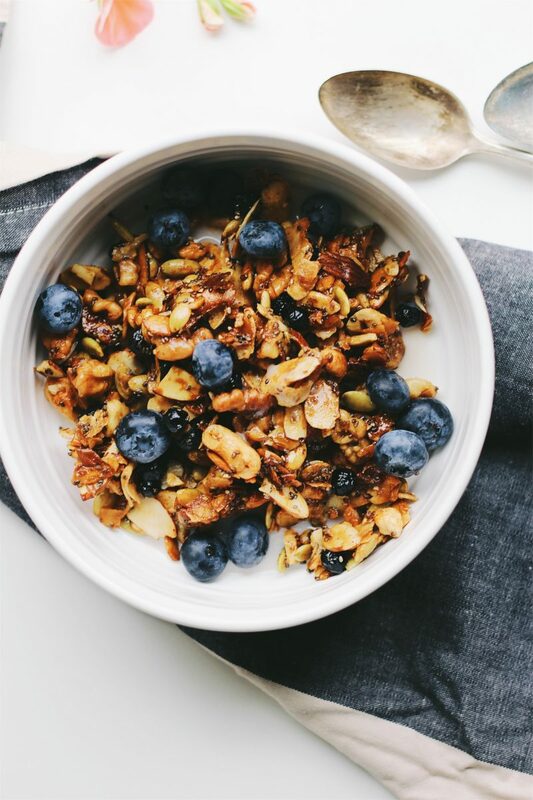 When the granola is evenly brown, remove from the oven and stir in the dried blueberries. Press the granola down firmly again, using an offset spatula or the back of a measuring cup. 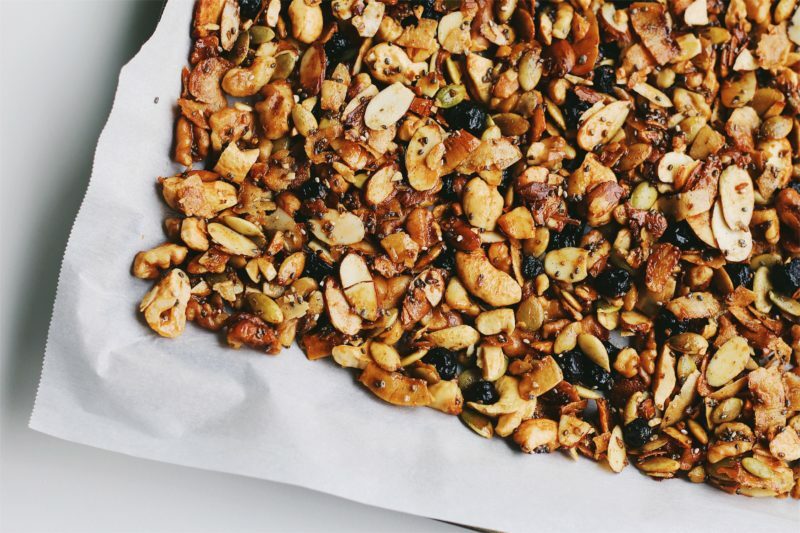 Let the granola cool thoroughly for at least 45 minutes, and then break into pieces. 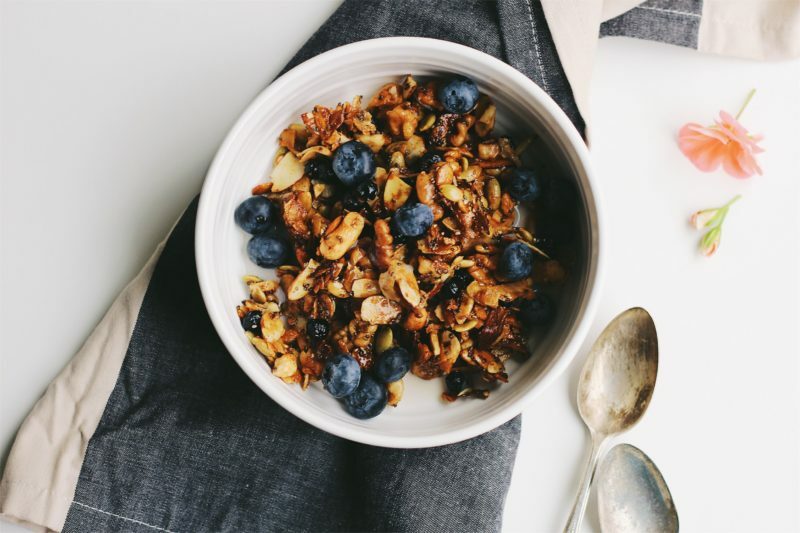 Store the granola in an airtight container at room temperature for up to 1-2 weeks. Make sure that the granola is brown before removing from the oven, but not burnt. The granola should be a deep golden brown and fragrant. Under-cooking the granola will result in soggy granola instead of a crisp, crunchy granola. 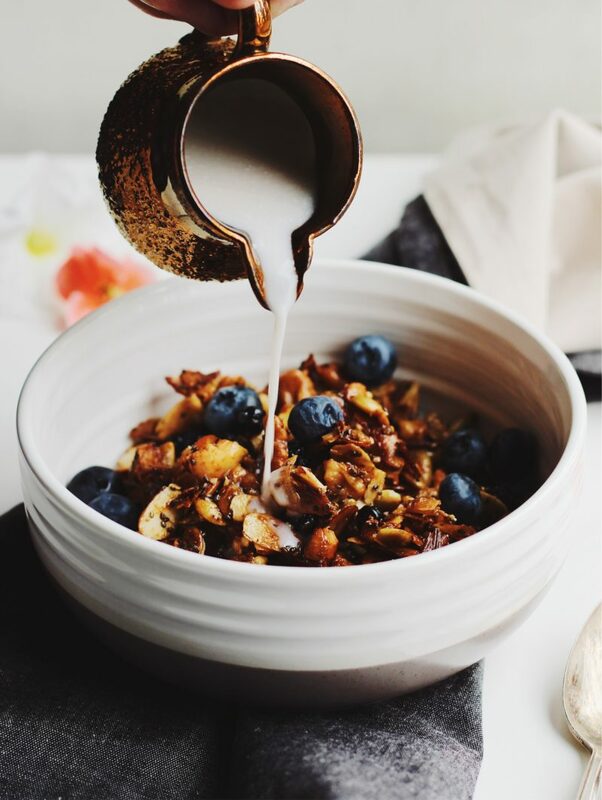 To make this granola vegan, use maple syrup in place of honey. Tip: When measuring honey, measure the coconut oil first in a measuring cup. This will grease the cup and your honey will come out much easier! 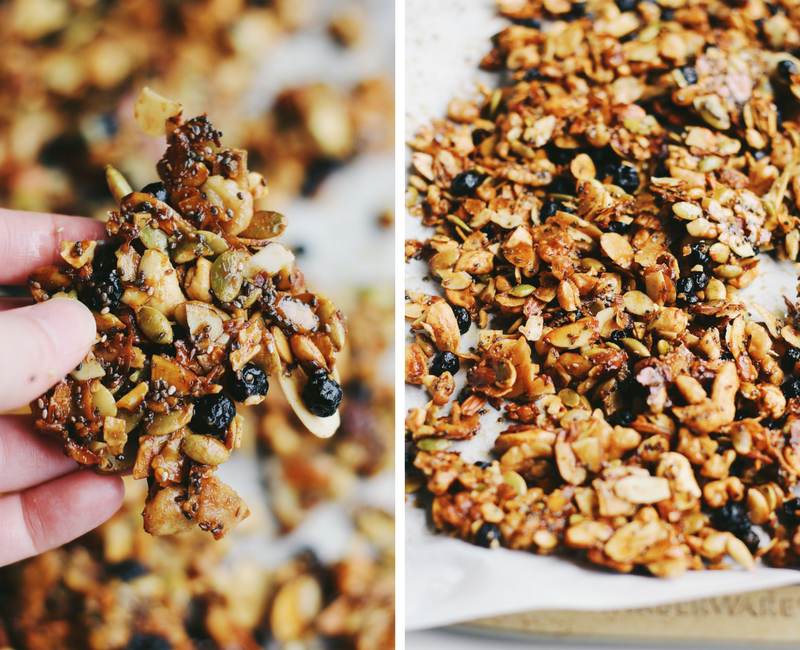 Pressing the granola down firmly is what ensures it’s crispy and “sticks” together to form those delicious clusters. Allowing it to cool completely is also important here, and allows it to set. 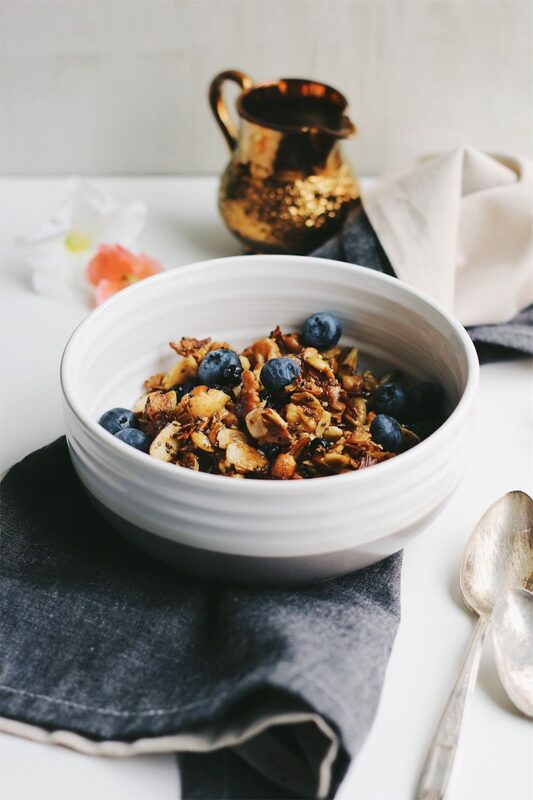 I hope that you enjoy this Superfood Grain-Free Granola! What is your favorite way to use coconut oil? Let us know in the comments below. This is a perfect breakfast recipe, Tiffany! I love the combination of these nutrient-dense ingredients. Can I use maple syrup instead of honey? Thank you Agness! I have not tried this recipe with maple syrup before, but I assume it would work. 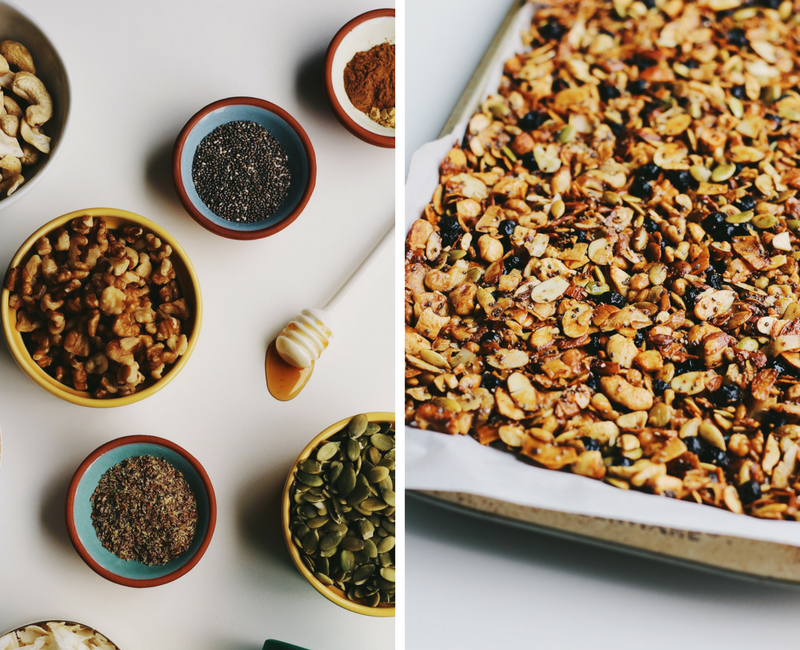 I like to use honey because it helps the ingredients “stick” together and form clusters like regular granola. However, I’m sure it will be just as delicious with maple syrup! So many yummy ingredients! I’ve been thinking about making my own granola. This is inspiring me to try. I’m completely with you – morning are not made for cooking – especially not before coffee! So this would be an absolutely perfect option for me as well. 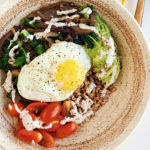 It looks not only super healthy but completely yummy too! If I make something like this (when) I need to hide it from my daughter or she would be hiding it from me! 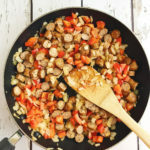 I never get to eat stuff like that – as soon as I make it, it is gone! This is the real superfood that I would love to eat everyday. Good for the heart, for the immune system and for the brain. Granola bar at home, I never thought of it. But this this is the look so good and healthy, I must try it ASAP. Um..hi, 50lb bag sent to me please? Weekly of course. This was so easy, and so delicious, and I think I ate it in every way possible. Used a little yogurt with it, a little cereal other mornings, just as it was most of the time and I’m sure other ways I’m forgetting. I’m too busy drooling again and I can’t think straight. I really did enjoy the simplicity of the ingredients and the time it took to make was so minimal. 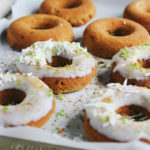 The flavors were great and the texture very appealing, great recipe and great post! Oh my goodness. This looks so delicious! I have always wanted to make my own granola but I haven’t been able to find a recipe that I felt I could make. This one I have pinned as I am going to attempt it because it just looks so good!